In today’s ultra-connected world, creating separation between work and play can be a challenge and knowing how to stop thinking about work is often on people’s minds. When your boss can reach you by phone call or text message at any hour of the day (or night), it can be impossible to ever truly feel ‘off the clock’. This can be even tougher if you work from home or own your own business. The temptation to answer that one email can be too hard to resist, and it’s easy to find yourself answering client questions over dinner with your family. Our phones have become an extension of our bodies, and it can be impossible to separate ourselves from our technology. Think about it – when was the last time you went anywhere without your phone? It’s probably been a while, and infobesity (information overload) is a thing. Because your phone is with you all the time, if a work-related call comes through, it can be easy to quickly answer and get back to what you’re doing. Nope – not acceptable. Don’t do it. Draw a line in the sand and stay on your side. Repeat after me. “I won’t take work calls when I’m off the clock.” Instead, enjoy your time off and relax. If you really can’t fight the temptation of answering calls and emails in your off-hours, you might even want to consider getting separate phones – one for work and one for your personal business. I promise, your work will be even better for it. The moment you hear that ‘ding’ noise notifying you of a new email, it can be hard to fight the urge to check your inbox. When it’s your day off, turn off your notifications because they can become a huge distraction. As a working mum who works part-time, I don’t expect the people I work with or clients to remember my work days and hours. At the bottom of my email signature, I have the days and hours I work and I always ensure I turn on my out of office message for my days off. The out of office includes a message to the sender stating that I am not in the office, it states when I will return and who to contact if it is urgent. I’ve found that doing these couple of things reduces the number of emails or phone calls received because they either wait until I’m next at work or they contact someone else. If you use your personal computer for work – or your work computer for personal reasons – it can be impossible to ignore the incoming emails when you’re simply catching up on the news. Create separate user accounts – one for work, and one for fun. Keep your work-related programs contained with your work email and repository. Use the other account for browsing Pinterest, chatting friends on Facebook, paying bills, and whatever other personal stuff you do. If your work tends to creep on into the evenings, cutting into your time off, don’t let it. Decide what time you’re going to wrap it up for the day and stand firm. Working late into the evening makes it difficult to separate ourselves from our emails and work projects. If you can make a habit of wrapping things up at the same time each day, you’ll find over time it’s easier and easier to stop working and start having a little fun. If you’re known to go past the time, set an alarm. Creating a real divide between work and play can be tricky, trying to stop thinking about work isn’t easy and takes practice and self-discipline, but it’s essential for your mental health. 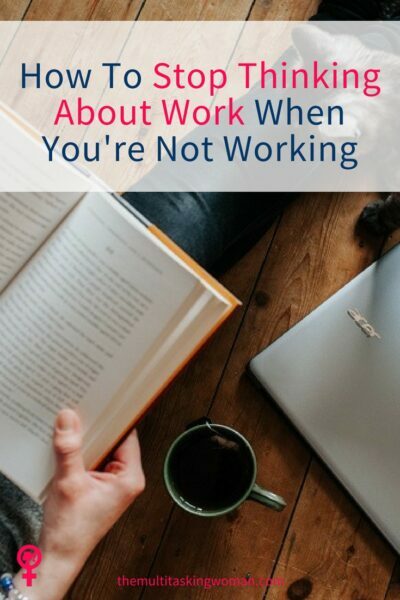 Allowing yourself to get burnt out and worn down because of overwhelm is no fun at all, so take some preventative measures and let yourself enjoy the time you’ve worked hard to take off. You deserve it.